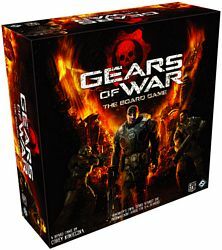 Gears of War™: The Board Game, designed by Corey Konieczka, is based on the wildly popular third-person shooter by Epic Games. One to four players take on the roles of COG soldiers cooperating to destroy the Locust horde, and must work together to complete missions against an ingeniously challenging and varied game system. In Gears of War: The Board Game, you’ll relive classic moments from Gears of War™ and Gears of War 2™. Roadie Run into cover, spray your enemy with blind fire, or rip him in half with your Lancer’s chainsaw!